CALLAHEAD appreciates our American heritage and its classic old world style. To keep that history alive we are proud to introduce to our customers the CALLAHEAD CLASSIC. CALLAHEAD has reinvented the old world wooden outhouse for those traditionalists who appreciate, as we do, the nostalgia of our American heritage. When the Pilgrims settled in America, they used outdoor bathrooms, since they had no running water or indoor plumbing. These bathrooms were called 'outhouses' or 'privies'. Our CALLAHEAD CLASSIC will bring you back to that American heritage with its blue stained wooden design and carved moon on the side walls of the unit. Inside this classic unit is a dark mahogany wooden toilet seat with brass hinges and a stainless steel drop tube to where the waste drops into a large 55 gallon holding tank. 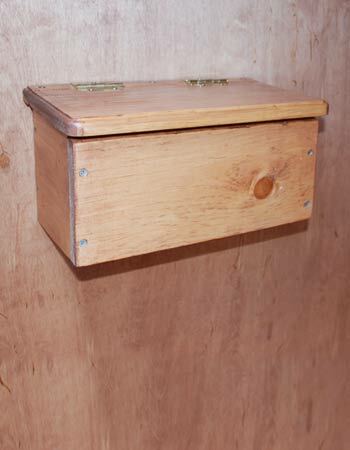 To keep with the feel of the tradition of our American Pioneers we have included an old fashioned wooden double toilet paper holder. The CALLAHEAD CLASSIC is spacious and completely private, has brass hinges on the door and CALLAHEAD's signature navy blue signage. 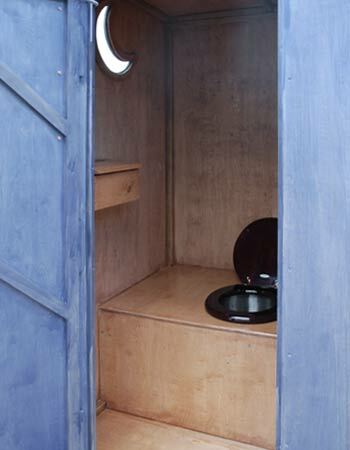 This CLASSIC portable restroom has the perfect look of outhouses used by our forefathers so users will enjoy the comfort and privacy of yesterday. The CALLAHEAD CLASSIC is the perfect opportunity to bring back old world style to your special event or job site. Undoubtedly the CALLAHEAD CLASSIC will be a conversation piece. As with all of CALLAHEAD's portable restrooms and equipment we use only the finest materials and innovative designs to create this replica of our American history and continue, "To Develop and Evolve a Human Necessity." Check list posted inside dates and signed at each service. Recommended Use: 6-8 people on an average 40 hour work week.